First Novels Club: WINNER of Where She Went! Let's recap this giveaway, shall we? 1. 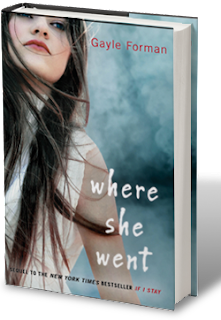 ARC of Where She Went, Gayle Forman's incredamazing sequel to the epic If I Stay. 3. PERSONALIZED TO THE WINNER. So after tallying up the 200+ entries and throwing them into Random.org's delightful List Randomizer, we have our winner! Frankie's bringing your ARC to NYC tomorrow to get it signed and personalized by the fabulous Gayle Forman (oh Frankie I'm sooooooo jealous!!!!) at the Where She Went launch party! Thanks to everyone who entered -- and get ready to read Where She Went TOMORROW! Stay tuned for more WSW awesomeness this week on the blog, including a launch party recap! Thank you so much. I will be really happy to have this book.